Great news from Bob McKeage at Merle Wood & Associates as he closes on the sale of two motor yachts today, the 40.2m Crili and 47.9m Thirteen. Bob represented the seller for Crili with Jim Webster at Webster Associates acting for the buyer. Built in 1999 by Trident Shipworks, this superyacht’s interior by Elizabeth Dalton sleeps eight guests in four staterooms and twin 720hp Caterpillar engines give her a cruising speed of 12 knots. Crili has been used privately for the past six years and has been constantly maintained without regard to budget. The asking price was $8.5 million. Although jointly listed with Mark Elliott at International Yacht Collection, Bob says Thirteen was sold in an in-house Merle Wood deal as he acted for the buyer. Thirteen was built by Christensen in 2006. Her elegant interior by Kenneth Alpert Design Group accommodates 12 guests in a full width master suite on the main deck, a full width VIP suite and four other superbly decorated guests cabins. 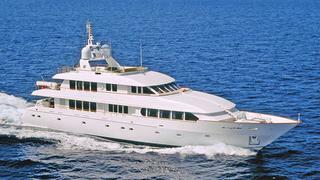 Her features include a four-deck elevator, zero speed stabilisers and a large sundeck with a spa pool, bar and barbecue. Thirteen also has a relatively shallow draft of only 2.36m, enabling her to reach cruising areas in the Bahamas and was asking $28.5 million.